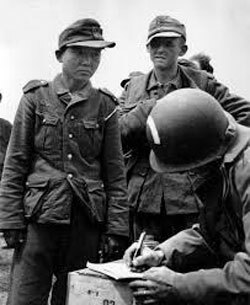 Born in 1920 in what is now North Korea, in 1938 he was forcibly conscripted into the Japanese army and sent to fight in Manchuria, where he was captured in battle by Russian troops, 1939. He was later forcibly conscripted into the Russian army and captured by German troops near Kharkov in 1943. Conscripted into the German army, he was captured by US paratroopers shortly after D-Day and sent to a POW camp in Britain. In 1947, he emigrated to the USA and settled in Illinois, where he died in 1992. He told his story to no one; his children uncovered it when they contacted the US Army for information about him. Check out our refurbished website. We added info and fixed mistakes. Let us know if you think there’s something wrong or missing: info@nullcaddellwilliams.com. We had to change servers, and couldn’t transfer the existing account info onto the revised site. We regret that you will have to set up your account again the next time you order. We’re sorry for this. Life on the web…. Maison Surrenne petite champagne is back in stock. Its price (ouch!) is due to the fact that the underlying grapes are no longer available (snapped up by a big house for the Chinese market) and that this cognac is now bottled out of older and irreplaceable stock. It is very good stuff, richer than the former version. Check out the new page on the site devoted to “Old & Rare”, namely limited-release brandies from the amazing G-R cellar. 30-year-old brandy? Sheesh. I was there when it was distilled. There’s brandy in it from before we had built the aging cellar: we stored the 1983 barrels at Parducci Winery. Joe Corley has been working on these new bottlings for three years. Talking straight, if I took a sample of say the barrel 351 to Delamain or Martell and said, can you match this? – there would be a lot of foot-shuffling. This stuff is that good. The official release date is October 1, and we will start taking orders with the September catalogue. The price of Old Havana and Anno Domini will go up modestly, but we’ll honor orders at the current prices through September 30th. What we have left of Hangar One, bottlings from before the brand was sold that we bought a bunch of – amazing stuff – is on sale for $15/bottle. When this stock is gone, that’s it for the original Hangar One.